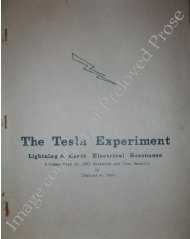 In 1983 Charles Yost claimed to have replicated Tesla's discovery of lightning-induced standing waves in the spherically conducting terrestrial transmission line. This a first-hand account of the author's investigation of the signatures generated by natural atmospheric electrical discharges. It documents a successful attempt to find evidence of terrestrial resonance as Tesla claimed to have done in Colorado Springs in 1899.